Beginning 2012; LaTeX, Kindle and secure emails. I love to read, in particular using the Amazon Kindle application on on either my Asus EEE Transformer Pad or my iPad. But being the computer geek that I also am, I figured it was about time to look into how the mass bunch of these books are deployed. 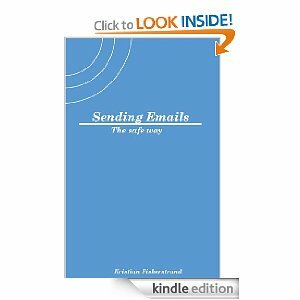 As I already had a draft copy of a book titled Sending Emails - The Safe Way, something I wrote back in 2007-2008 while trying to explain the use of Digital Signatures and Encryption in order to secure emails, what better place to start testing. The book itself is, as most I've written, prepared in a Document Preparation System called LaTeX. Ok, so the name might bring up some wrong associations, but the fact is, this is quite probably the best environment to write any scientific papers. In addition to having a very nice bibliography system called BibTeX for referencing, it is superior for equations, hence heavily used in particular in scientific academia. This, in addition to being built on the base of the typesetting system TeX, makes it far superior in terms of typesetting matters such as kerning, hyphenations and ligatures, something other writing tools (in particular MS Word) lack completely. As this isn't supposed to be a LaTeX post, I'll just stop there and refer to wikipedia and wikibooks.org for more advantages to the curious. But where greatness ends, trouble arise. As LaTeX is a typesetting system, it is naturally page oriented to either a book or an article format (in addition to other document classes). The Amazon Kindle format, as well as ePub and other generic formats, are on the other hand flow-oriented. That means that line-breaks and handling of hyphenations, that you would normally leave to the typesetter, is handled by the device on-the-run. Due to the limited capacity for resources, and the nature of the flow rendering (in page oriented it doesn't matter if creating the initial page takes some time, as it will only be done once (write-one-read-many)), the instruction set for flow-oriented documents is more limited. The underlying format used for these devices is actually the same as used on this website (and any other), HTML (or for the prudent reader, the XML based counterpart XHTML with a subset of CSS). Ok, lets take a stop here. HTML was something I have used to mark up text for what is approaching two decades way too quickly. The simplified nature of it also means that the author is losing a lot of control of how things are viewed, but have to depend on proper formatting by the various devices on the market. An increasing number of the eBooks that are distributed are prepared by lay-men, and the automatic tools for conversion by Amazon is more targeted towards Microsoft Word documents than anything else. But hey, it boost the available products and is cheap for the distributors, so I would probably do the same if I were them, but I still consider it a shame. In any case, while I'm contemplating other (fiction-related) projects for 2012, at least I've gotten around to testing the system a bit and made my first book available at both Amazon Kindle (eBook) and a printed version (certainly no surprise that I'm most satisfied regarding the printed version). Author Kristian FiskerstrandPosted on December 31, 2011 January 1, 2012 Categories Books, SendingEmailsTags books, HTML, iPad, kindle, LaTeX, openpgp, pki, security, sks, XML2 Comments on Beginning 2012; LaTeX, Kindle and secure emails. For those who haven't gotten to know this project, yet, I started it in 2006 when the former random.sks.keyserver.penguin.de round-robin pool by Bjoern Buerger went offline. The SKS Keyservers provide the public key component / certificates in the Web of Trust of which OpenPGP ("Pretty Good Privacy") is based on. The whole framework is used in order to facilitate digitally signed and encrypted email messages. In an environment where the governments implement schemes such as the Data Retention Directive (EU), and documentation shows that US used its Echelon surveillance network to promote Boeing's business (in 1994), one can't stress the importance of encryption enough. But even for those who don't feel this need, email is becoming an increasingly important method of communication - and without digital signatures, anyone can spoof an email address. Despite this, surprisingly few have decided to invest any time or effort into securing their digital communication. That was also the reason for me starting to write my still un-published book in 2008, Sending Emails The Safe Way. I started this with the intention of convincing more people about the necessity and teaching them about the various elements related to proper security. The more I wrote, however, I noticed that my writing got more technical and in the end I concluded that the book was not suitable for the intended task, but was rather aimed at system administrators. Realizing this I never got around to finished the book. However, the parts I wrote during a couple very interesting weeks can nevertheless be downloaded in PDF format. By now all but the cryptography theory and history is outdated, including quite a few of the references found in the footnotes, so any new effort at writing something on the subject would be from scratch. Based on the adoption rate of the technology, it sure seems necessary. Its been a while since I've gotten around to do any programming, so over the weekend I've finally gotten around to adding some new features to sks-keyservers.net . Most notably SRV records have been added , and in this process I introduced performance timing of the servers in the pool. This is now reflected both in the SRV pool and in the primary pool of A records. Hopefully this makes the pool even more responsive and improve the user-experience. In addition usage statistics of the pool has been added by analyzing the bind query log across the various DNS NameServers involved.